The list of APTA Dealers provides you with access to any APTA member's contact details, including locations of their retail offices and a listing of links directing you to their Internet Trading operations. Forthcoming Events and Shows and the listing of forthcoming Public Auctions around Australia. For many events, APTA produces Limited Edition Overprinted Show Products for sale. We recommend you join the Standing Orders List for securing and obtaining these souvenirs as they often sell out at the shows. Just click the link, complete & post the order. Also, our Gift Vouchers are a perfect gift and are redeemable through any APTA member. Our Warranty Certificates are ideal for assuring philatelic purchases of considerable value. Just ask your APTA dealer for details or contact us.. It's easy joining the APTA mailing list by clicking here ( APTA Mailing List ) or the main button at the top of the homepage. You'll receive our regular monthly E-News magazine containing the latest calendar of events, details on our Show Souvenir Products and notices of selected activities and auctions. As a member, yoú will receive notifications of our main shows listing all attending dealers, as well as our the next issues of our annual Year Book for free! There is no cost in joining the APTA Mailing List. For your peace of mind, our membership list is not disclosed to other parties and is used exclusively by APTA only for show and email notifications, including APTA publications. 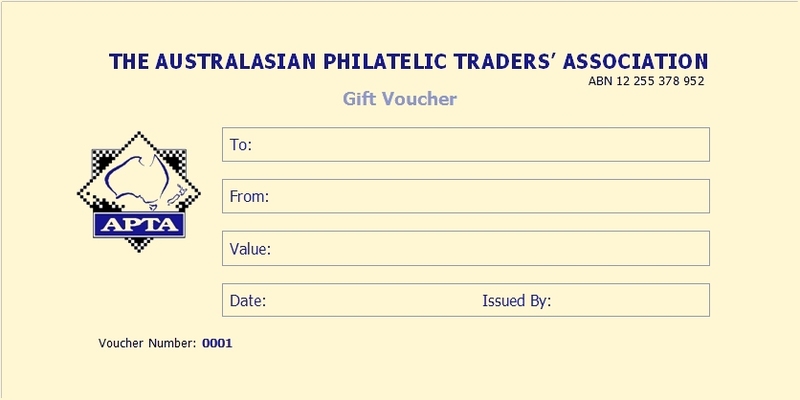 Founded in 1948, APTA is the peak national philatelic trade association in Australia. With world-wide based members, we co-operate with member associations affiliated with the International Federation of Stamp Dealers' Associations (IFSDA) and other philatelic bodies. The Aims of APTA are to develop and maintain a high standard of business ethics, to provide benefits and services to members and to promote the hobby of philately. APTA Membership embraces dealers, accessory manufacturers, wholesalers, publishers of philatelic literature and employees of members. Regardless of the size and type of your operation, APTA membership is an investment that will be most beneficial to you. APTA supplies a membership certificate, lapel badge and Code of Ethics for display purposes and its logo in various forms for advertising display and use on stationery. For further details about APTA, you may send your request to PO Box 929 Yeppoon QLD 4703.